Most of the science focuses on the amygdala, the almond-shaped structure deep in the brain (one on each side) that generates such feelings as fear and anxiety. In 2005, a team led by Gleb Shumyatsky at Rutgers University reported in the journal Cell that stathmin, a protein produced by the STMN1 gene, has an important role in the amygdala. Mice that were bred not to have the protein explored more of a new environment. They lacked what the researchers called “innate fear” and were unable to form memories of fear-inducing events. The researchers also manipulated the gene as a kind of “volume” control, producing different levels of stathmin, which in turn resulted in different levels of fear in the mice. In 2010, researchers led by Burkhard Brocke at the Institute of Psychology II in Germany found that people with an exaggerated response to fear had mutations in the gene that controls this volume switch. As for how we overcome fear, scientists have found brain structures that appear to resist the prompting of the amygdala. In a 2010 study published in the journal Neuron, the neurobiologist Uri Nili at the Weizmann Institute in Israel scanned the brains of research subjects who were afraid of snakes as they decided whether or not to move a live snake closer or farther away on a conveyor belt. The more people were able to overcome their fear and move the snake closer, the more activity they showed in the sgACC, a brain region that sits between the amygdala and the hypothalamus, which stimulates the release of hormones. A control group that wasn’t scared of snakes didn’t show such activity. Hormones released in the amygdala itself also have been shown to affect bravery. Oliver Bosch, a neurobiologist at the University of Regensburg in Germany, studies maternal instinct in mammals and has found that oxytocin is released in the amygdala when a mother faces a danger to herself and her children. This hormone, in turn, blocks the production of a hormone called CRH, which primes the body for action but can generate feelings of fear and anxiety. It is this sort of hormonal override that would have given Angie Padron, the mother in Florida, the instant courage to confront her assailants. As she herself said of the incident, her instincts just kicked in. Indeed, taking the amygdala entirely out of the picture can virtually eliminate fear. Justin Feinstein, a clinical neuropsychologist at the Laureate Institute for Brain Research at the University of Tulsa, works with three women, known in the literature just by their initials, who have Urbach-Wiethe disease, a rare genetic disorder that destroys the amygdala. One of them, SM, has never experienced fear in her adult life. A man once threatened her by putting a gun to her head and shouting “Bam!” She didn’t flinch. Of course, it’s not necessary to have a brain disorder in order to control one’s fear, even in the face of heart-stopping danger. Consider Alex Honnold, the climber who has scaled the 3,000-foot El Capitan in Yosemite National Park without ropes (as featured in the new documentary, “Free Solo”) and made other notable ascents. In 2016, Mr. Honnold’s brain was scanned by neuroscientist Jane Joseph at the Medical University of South Carolina in Charleston. When exposed to images that excite the amygdala in most people, his brain scans showed no response. What’s unclear is whether this capacity predates and enables his daredevil climbing or has been created by it. But the amygdala isn’t the only candidate for controlling fear. In a study published earlier this month in the journal Nature Communications, Sanja Mikulovic and colleagues at Uppsala University in Sweden showed that cells called OLM neurons produce theta brain waves, which are seen during meditation and when you feel safe despite a threat in the environment. By manipulating those cells in laboratory mice, the scientists were able to dial up a mouse’s willingness to venture into unexplored areas and tamp down its indications of anxiety, even when smelling a cat. Nicotine also stimulates OLM neurons in humans, a reason that some people chain-smoke to relieve stress. We know, too, that training and conditioning alters pathways in the brain and can help to mitigate stress and promote calm in fearful situations. A study published in the journal PLOS Biology last year showed, for example, how training instills a kind of autopilot setting. Researcher Sirawaj Itthipuripat at the University of California, San Diego, measured brain activity when people were learning a task and found that less was needed after training, though improvement in performance remained. Another recent paper connected that idea to how people respond to uncertainty and threats. A team of German and Greek researchers completed a nine-month longitudinal study, published in the journal Science Advances, that showed some forms of training changed structures in the cortex and reduced secretions of the stress hormone cortisol. Military training is partly designed to hold fear in check when carrying out missions that risk death and injury, as well as in the case of disaster. Dave Henson’s training before he deployed to Afghanistan helped him to stay composed while detecting and disarming improvised explosives. Then, a year into his tour, Mr. Henson stepped on an IED. He lost both of his legs. Once the immediate shock of the blast receded, he found himself reciting the process that he had been trained to follow in the event of a casualty scenario. “The training definitely kicked in,” he says; it distracted him from the pain. I haven’t read The Da Vinci Code — or any other conspiracy thrillers, now that I think of it — but I have to assume that Hans G. Schantz‘s Hidden Truth series reads like Dan Brown’s bestselling novel — but with physics taking the place of theology. Schantz can credibly weave physics into his story, because he is a trained physicist and “wrote the book” on The Art and Science of Ultra-Wideband Antennas, and the first book definitely made me want to know more about the pioneers of electromagnetic theory — many of whom did die young or inexplicably left the field. I may have to read Neovictorian’s own Sanity next. What makes Art & Arcana so special are the creative minds who came together to write it. 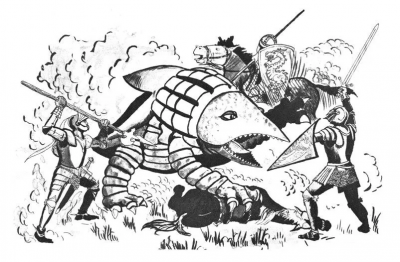 They include Michael Witwer, author of Empire of the Imagination: Gary Gygax and the Birth of Dungeons & Dragons, and Jon Peterson, author of Playing at the World, two of the most well-regarded books on the early history of D&D. Together with filmmaker Kyle Newman and actor Sam Witwer, their depth of knowledge is as substantial as the massive, 440-page coffee table book itself. 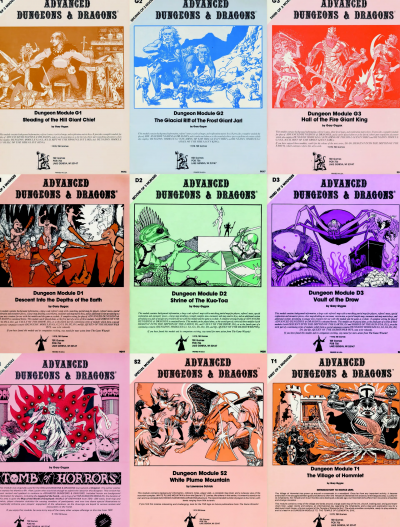 Art & Arcana is especially informative for those who’ve come to D&D with its fourth and fifth editions, both of which were launched after the turn of the century. 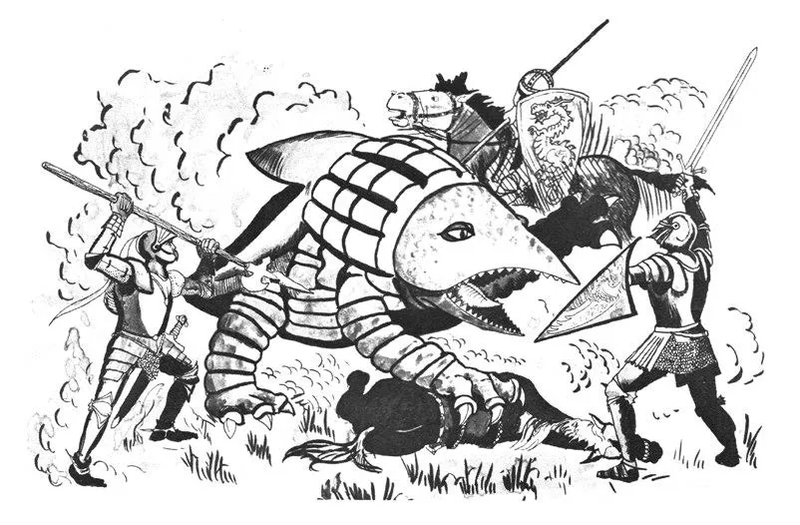 Many new fans simply aren’t aware of just how grassroots the birth of the original RPG was, or how it challenged its creators, Gary Gygax and Dave Arneson. Illustration was particularly difficult to secure. Neither of the two men were trained artists, but their imaginations were overflowing with wild creature designs. How do you describe a mind flayer or a beholder to a consumer, let alone the poor artist tasked with drawing one for the first time? The communication challenges alone are astonishing, and Art & Arcana does an excellent job explaining them in the context of the evolution of the look and feel of D&D as we know it today. 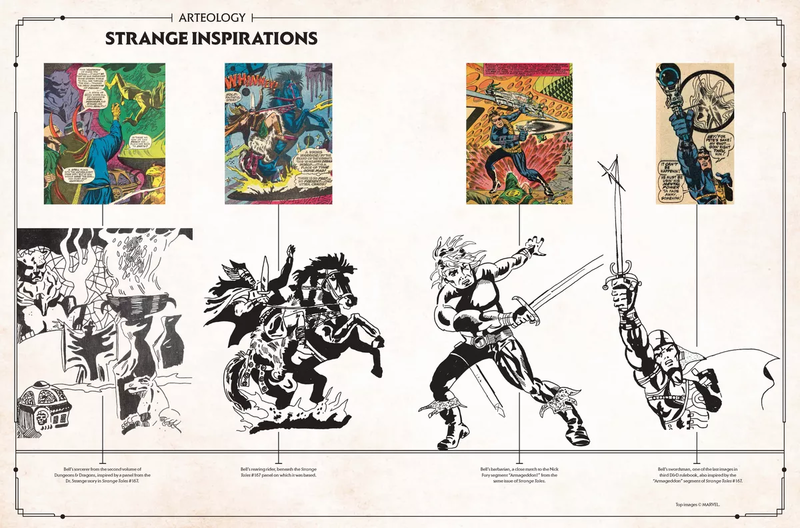 It was also heavily inspired by period Marvel comics. Some of D&D’s earliest images were, in fact, conspicuously similar to pages from Strange Tales #167 featuring Dr. Strange and Nick Fury. 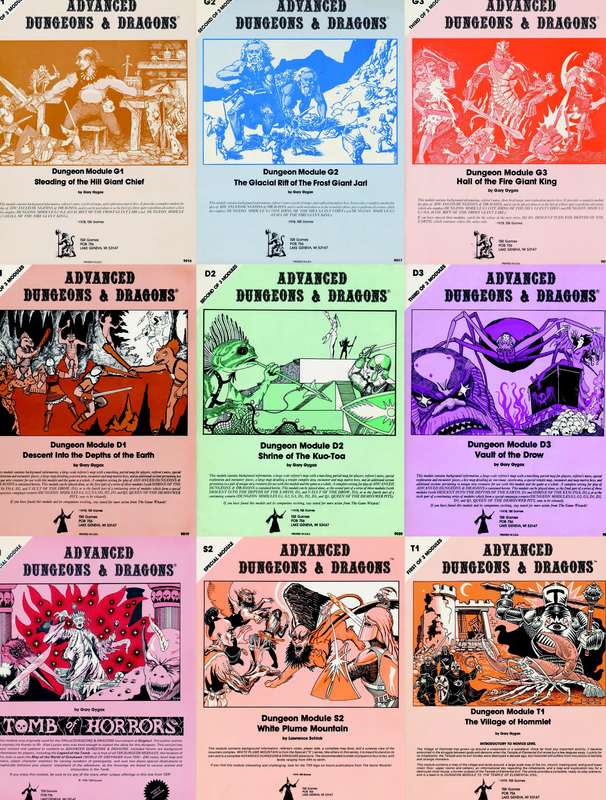 Some of D&D’s most iconic adventures, dating to 1978 and 1979, have a unique pastel cover. Assembled together on a single page, these so-called “monochrome” covers create one of the many collages that make Art & Arcana such a delight to explore. The two explanations aren’t mutually exclusive. I ran to my mamma and my mormor — my grandma — and some other relatives who were all sitting outside having fika, which is Swedish for having a sit-down with coffee and cookies. I was yelling, “I found a sword, I found a sword!” Daddy went to show it to our neighbours, whose family has lived in the village for more than 100 years, and they said it looked like a Viking sword. Daddy didn’t get to watch the football in the end. She made me promise not to tell anyone because she and other archaeologists wanted to see if there was anything else buried in the lake; they didn’t want anyone else to come and take the treasures. Then they announced the news and I could finally tell everyone at school. I came back from gym class and the whiteboard said, “Saga’s sword” and there were balloons, and the whole class got to have ice-cream. Unveiled last year, the BolaWrap™ 100 is a hand-held remote that allows officers to quickly fire barbed Kevlar cords toward suspects at speeds of 640 feet per second. The stated goal of the product is to entangle a person’s limbs “early in an engagement,” thereby allowing police officers to avoid using lethal force. The intended target is described by the company as “the mentally ill population” and, elsewhere, “the bad guys.” Each unit costs $800, and sounds like a gunshot when discharged. Wired Technologies, which manufactures and distributes the wraps, claims that 24 police departments across the country are testing the product internally, and that six departments are testing it in the field. A version that sounds less like a gunshot is currently in development, for use on college campuses, according to Mike Rothans, the senior vice president of Wrap Technologies. During Thursday’s demonstration, Adams, flanked by Rothans and Wired Technologies CEO David Norris, assured reporters that the product was neither painful nor dangerous (Adams did wear protective goggles, just in case). The trio brushed off questions about whether it might be more difficult to deploy the wraps in a crowded, high-pressure environment, rather than a tightly controlled courtroom, by pointing to the device’s laser sight. 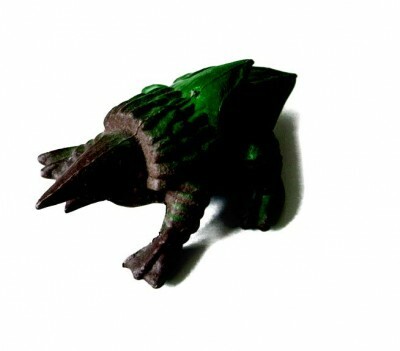 Despite the fact that a website advertises the wraps as having 380 pounds of strength, Rothans promised that they wouldn’t be strong enough to strangle someone if accidentally fired at their neck. In Adams’s estimation, the device could successfully subdue about 70 percent of the 150,000 or so emotionally disturbed individuals encountered annually by the NYPD. The department’s handling of such cases—known as EDPs—has attracted scrutiny in recent years, with advocates demanding better training for officers responding to mental health crises, particularly following the deaths of Saheed Vassell and Deborah Danner. Did legendary college basketball coach John Wooden rely more on praise or criticism? Psychologists Roland Tharp and Ronald Gallimore were interested in education and learning, and thought that observing and analyzing John Wooden’s teaching methods might deepen their understanding of learning. Or more specifically, help them understand how more teachers can get the very best out of their students. So, over the course of 15 practices during the 1974–1975 season (Wooden’s last at UCLA), they sat, observed, and systematically tracked Wooden’s specific coaching behaviors — which added up to 2326 “acts of teaching” in total. So how much of this was praise? And how much was criticism? Just over half (50.3%) of Wooden’s behaviors were pure instruction — specific statements about what to do or how to do it. No judgment. No approval or disapproval. Just information. Next up were praise (6.9%), scolds (6.6%), positive modeling — or how to do something (2.8%), and negative modeling — or how not to do something (1.6%). So, altogether, ~75% of Wooden’s teaching acts contained specific information geared at providing the athlete with a clearer picture of what to do or what not to do. The researchers felt that this was a major contributor to his coaching success, and it also makes perfect sense given that Wooden, at his core, always saw himself as an educator. After all, simply knowing that something is good or bad is not especially helpful if you don’t know what exactly should be repeated or changed the next time. Otherwise, it’s just more shots in the dark. Another of the researchers’ interesting findings was their observation of how Wooden modeled behavior. When Wooden saw something he didn’t like, and stopped practice to correct the incorrectly executed technique, he would immediately demonstrate the correct way to do the technique, then show everyone the incorrect way the athlete just did it, then model the correct way again. This correct-incorrect-correct demonstration was usually very brief and succinct, rarely lasting longer than 5 seconds, but making it very clear what his expectations were, and how to meet these expectations.